Enjoy this Slice of Paradise while Keeping it Green! Get up close with nature in this eco-friendly vacation package. This trip will give you a real Costa Rican adventure while choosing responsible partners that respect what makes this country so special—the environment. From cloud forests to pristine beaches, you’ll visit some hot spots and some off-the-beaten-path locations. At each stop on your trip you’ll enjoy hiking, see waterfalls and rivers, and disconnect from your daily routine. Each hotel practices sustainability in part by offering local and on-site tours that support the local economy and using locally grown ingredients in their restaurants. Eco-friendly doesn’t mean you have to give up style, though. You’ll get a real feel for each location with climate-appropriate accommodations that help feature your surroundings while offering you great amenities and comfort. This is a guilt-fee, green adventure you will never forget! * Not during holiday seasons. ** Only available for San Jose arrivals. One of our representatives will meet you as you get off the plane in San José and show you to your private transfer. Your Costa Rica adventure is about to begin! Enjoy the peaceful mountain views surrounding El Silencio Lodge just two hours after landing. 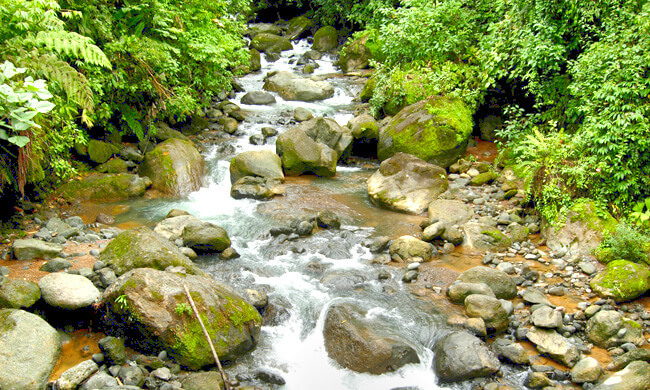 Get to know the cloud forest on a complimentary guided hike that follows a pristine creek through a series of waterfalls. 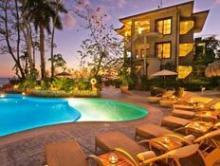 In the afternoon, opt for another local or on-site tour or further explore the immense property. If you prefer to stay in and enjoy your spacious suite, try out the private outdoor whirlpool or just enjoy some hot chocolate while taking in the view from your private deck. Take a private transfer from El Silencio to Manuel Antonio where you will be staying at one of the few beachfront hotels in the area, Arenas del Mar Beach & Nature Resort. Here you can indulge your taste buds at two on-site restaurants—one overlooking the coastline and one beachfront—which always feature the freshest local ingredients. Enjoy the tours offered like birdwatching and tortilla making. Arenas del Mar Beach & Nature Resort. 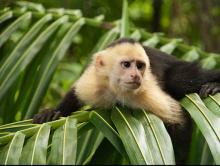 Venture into Manuel Antonio National Park on a guided tour. Keep your eyes open for the abundance of flora and fauna found here and listen to your informative guide talk about the area. After the tour stay at one of the pristine beaches inside the park to enjoy the sun, sand, and waves. Try to make it back for happy hour at the hotel and to watch the sun set over the Pacific. Today experience something special. Head inland to the small rural town of Santa Juana where you will enjoy local culture and hospitality while you help preserve the rural heritage and natural resources. 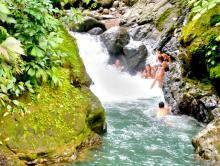 Go horseback riding, see oxen in a sugar mill, and go on a hike to a waterfall where you can swim in the cool water. Finish a great day with a delicious traditional lunch as you look out over the hills and out to the coast. Take a short domestic flight and transfer from Manuel Antonio to Puerto Jimenez. 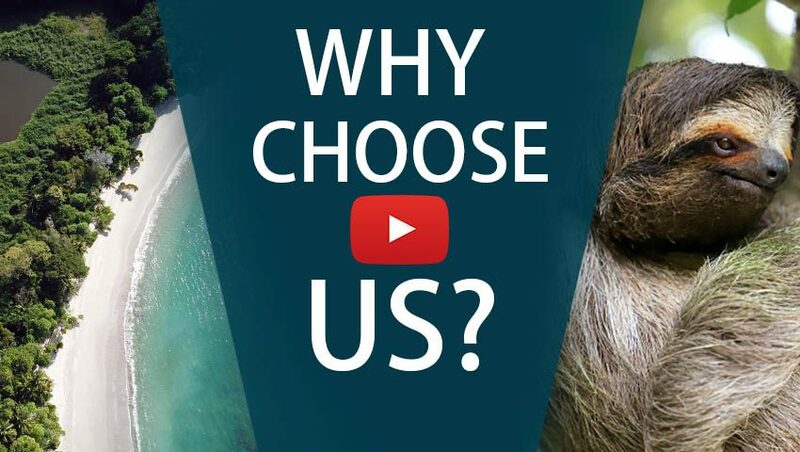 From there, you’ll transfer to the remote and picturesque Lapa Rios Eco Resort. Located in the biodiversity capital of Costa Rica, here you will have plenty of opportunities for spotting wildlife in a true stay in the jungle. Select one of the on-site nature tours offered by Lapa Rios. Choose from many interesting options such as the Early and Sunset Birds tour, the Wild Waterfall tour, the Matapalo Tour and Night Walk… to name just a few on the list! Day 8: Pick another tour! Enjoy another free day to choose a complimentary tour. Learn about the natural medicine you can find in the rainforest or opt for a walking tour of one of the many trails around the property. Take a domestic flight back to San José to catch your flight back home. Tucked into Costa Rica’s tropical cloud forests, El Silencio Lodge is a secluded eco-luxury sanctuary. Arenas del Mar is the best beachfront hotel and an ideal choice for anyone looking for understated luxury while being eco-conscious. 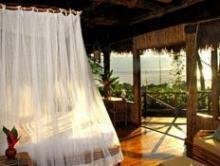 The best hotel for nature and wildlife is situated in the bio-diversity hotspot of Costa Rica's Osa peninsula. Lapa Rios is a meal-inclusive hotel! This guided tour takes you to the heart of paradise as you see sloths, monkeys, and much more. Ask your guide about the exotic flowers and plants that surround the paths. An authentic Costa Rican experience includes a visit to a revived rural community, a hike through the rainforest, and a waterfall swim!